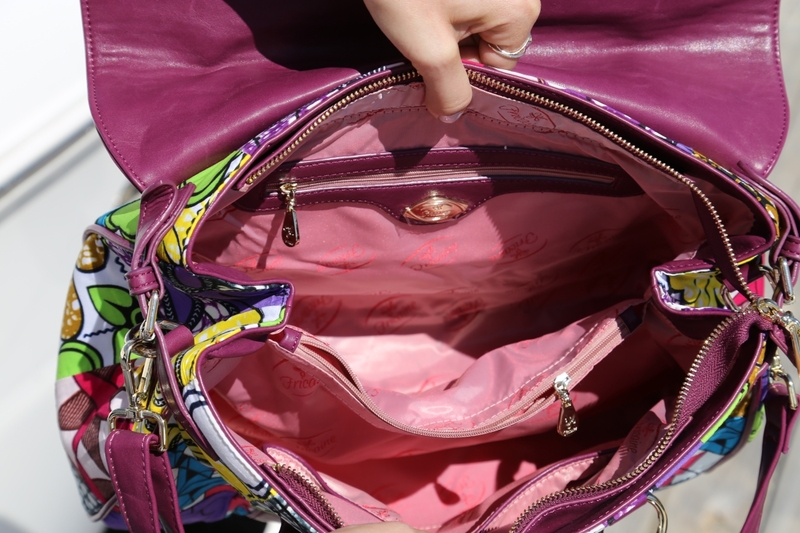 Nautical Stripes & Floral: Fricaine Duchess Shoulder Handbag + GIVEAWAY! I love a good nautical print for summer, but what I found really pairs fantastically with it, a beautiful bright floral print! This last weekend at the lake, I wore a fun striped nautical pencil skirt, faux leather top, loafer flats, and my gorgeous new Fricaine Dutchess floral print shoulder bag. ENTER TO WIN THIS BAG at the bottom of this post! I’m a big fan of Fricaine, in fact this is my second bag by them! They make some of the most gorgeous, unique, incredibly eye-catching, vegan leather bags on the market! Each bag is super high quality and the beautiful forged gold plated hardware is even coated with an anti-soul treatment to keep it from corroding, so you know you’re getting high quality materials and products when purchasing from Fricaine. The bag is super comfy to carry, even when you load it to the brim! The synthetic leather straps are incredibly durable and makes the bag look incredibly expensive too. Fricaine uses a cool wax print technology and four distinct print patterns for their bags, made with 100% cotton. I absolutely love the uniqueness of this design and the bright beautiful floral print! Each bag also comes with a beautiful custom made lining and lots of zippers and storage for organizing your belongings perfectly so they’re easy to find and reach! 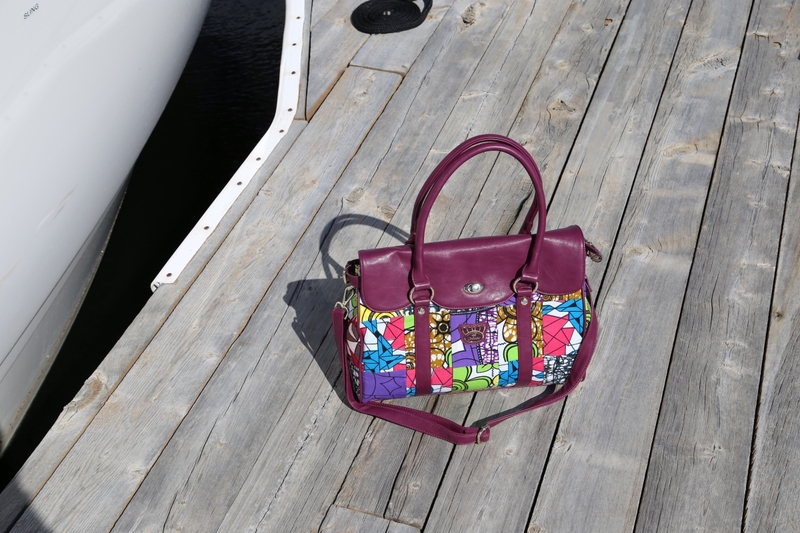 I’m incredibly in love with this gorgeous floral print handbag from Fricaine. It looks fabulous with anything and everything, and is such a statement-making piece, that it really adds drama and life to any outfit I wear it with! If you would like to pick up the Fricaine Dutchess Shoulder bag for yourself or shop the fabulous selection of handbags from Fricaine, you can Shop it on Amazon HERE or at Fricaine.com. Also, right now Fricaine has an amazing SUMMER SALE going on right now where you can get a whopping 30% OFF! 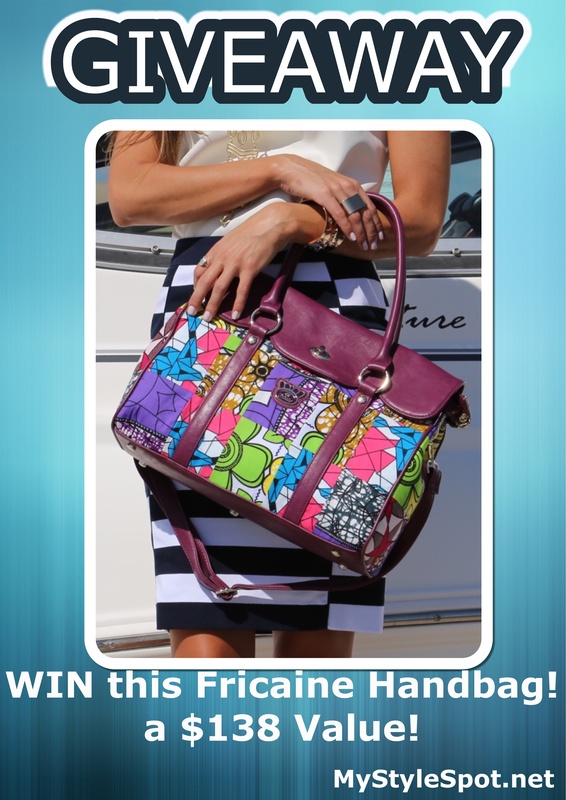 AND….. One of you lucky ladies has the chance to WIN THIS beautiful Dutchess Floral Print Shoulder Handbag from Fricaine right now! Contest is open to US only. *Please note names and emails are subject to be used by Fricaine upon contest entry. *I was given this product for the purpose of review. However, all thoughts and opinions expressed in this post are solely my own. I only share reviews with my readers, I feel will be informative or useful in some way. I would take this gorgeous thing everywhere I go! I would show it off to everyone I know! It is so unique, and I have been trying to win one for a long time! Date night with my fabulous husband!!! I would love to take this on vacation to Austin!! I would take it out to lunch. I would take it everywhere I go! Or I would give it to my mom for her birthday! I would use this as my everyday bag, so it would go everywhere I go! I love their bright colors & unique designs! I would take this bag to work with me!! I would take it out shopping to make all the other shopper’s jealous and wonder where I got it! I would take it everywhere. I already own one Fricaine and I absolutely love it! I would wear this bag anywhere. So colorful and pretty, would go with any outfit. Thanks so much. I would use this bag every day, I have decided to use all of my pretty bags rather than admire them hanging in my closet. I’d love to take it on vacation to the shore! It would be my main baG. i WOULD TAKE IT EVERY WHERE I GO AND BE PROUD OF IT. I am going on a cruise and it’d look great on my arm! I’d go everywhere with it! I would take this to the mall, out to eat, everywhere! Oh My Goodness!!! I would take this bag everywhere, to the casino’s out to lunch with my girls it would always be by my side LOLOL! it’s Adorable and I would take It everywhere! I would carry this bag everywhere I go! It could be dressed up or down. I would take this gorgeous purse everywhere I go! I am in love with it! Regarding the entry for ‘Retweet this Tweet.”–Twitter says it doesn’t exist, lol. No problem! It’s in my best interest, lol. This bag would be a fabulous carry-all for work. Also, just an FYI, I clicked on the link in the Rafflecopter to follow by email, and the link was broken. I signed up on the side of the page but just wanted to let you know! I would take this bag to work everyday. I would take that bag for a ladies night out! I would take this bag straight to my lady, who would LOVE the colors. I would take it to the local pediatric hospital where I volunteer. I think some of the kids would get a kick out of the fun pattern. I would take this to a local winery for girls night! I love this bag!